Stories about children helped by CSI. 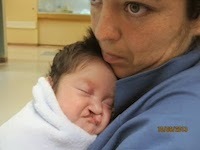 Francisco was born with a cleft lip and palate and subsequently was abandoned by his parents because of this ailment. He currently lives in an orphanage in Hermosillo. 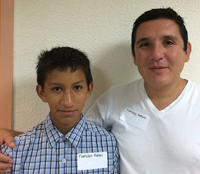 Francisco had an initial surgical repair for his cleft lip and palate as a younger child, but unfortunately he continued to have difficulty with speech and articulation. During an annual CSI mission to Hermosillo, a man who referred to himself as Francisco’s tutor brought him to the hospital to be evaluated by our surgical team. Francisco’s tutor, along with his friends who work at a local garage, have taken him under their wings and are trying to help him succeed in life. 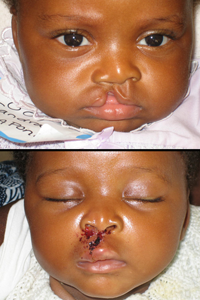 Francisco had his cleft palate repaired by the CSI surgical team. The procedure went well, and the surgeon was optimistic that it would help Francisco speak more clearly. For now, Francisco will receive follow-up care by the CIMA Hermosillo Hospital volunteers and staff, including speech therapy and orthodontics. 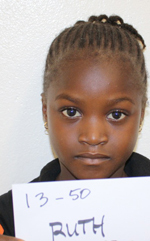 Ruth had just begun 2nd grade when she decided she no longer wanted to go to school. Her mother told CSI doctors that this was unusual because Ruth is very smart and enjoyed learning. Ruth finally told her mother that people couldn’t understand her, saying, “You talk through your nose.” Ruth was born with a cleft palate. When she and her twin sister were born, their mother tried to find a doctor to repair Ruth’s mouth, but she couldn’t find one in Liberia who had the skill to perform such a procedure. She heard a radio ad about CSI coming to Duside Hospital, but was worried about paying for surgery. Despite working hard selling used clothes in a market, she had no extra money for a hospital stay, let alone surgery. She couldn’t believe it when she heard that the surgery was being offered free of charge. “Only God will be able to pay you people for the goodness you have brought to my daughter. I thank my God for you people.” In the recovery room, Ruth said that she couldn’t wait to go back to school. 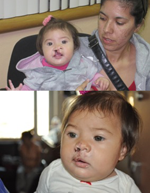 A young mother arrived at CIMA Hermosillo Hospital with her 5-month-old baby, who had been born with a cleft lip and palate. She was poor and spoke no English, but was determined to get help for her daughter. The power of a mother’s love was evident. 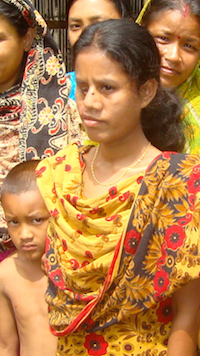 She had traveled by bus from her village, seven hours from the hospital. I asked her how she managed to get to Hermosillo without money. She told me she made bouquets, collected pots and pans, and cooked tacos to raise the funds to cover the bus ticket. Baby Camilla had surgery the next day, and her mom could hardly wait to bring her home and show her family and neighbors. Sandra was brought to the screening by her father. They had traveled for a day and a half to get to Kumasi. The day of her scheduled surgery came, but Sandra and her father didn’t show up at the hospital. The final day of the CSI surgery schedule, Sandra and her father arrived back at the hospital. We learned through translators that he was told his daughter could not have surgery until she was registered with the hospital. A booklet of immunizations that is issued to all children at the time of birth was required. He had left it at home, so he traveled 36 hours back home to get it and 36 hours back again. Needless to say, we quickly added Sandra to the surgical schedule. We later found out that the mother didn’t come to the hospital because she was worried nothing could be done to help her baby. It is not uncommon to encounter this type of fear and hopelessness in the countries we visit. When a family is shunned by their community and told repeatedly that no one can help, it is difficult to keep trying. Sandra’s father didn’t give up, and because of his love and devotion, together with the commitment of the CSI team and our hospital partners, her life has been forever changed. A reminder of why we ask people to give so much of their time and money came to us on the last day of a Peru mission. A family arrived from a pueblo outside of Puno, Peru. They had heard by word of mouth that there was a medical team from the United States in Arequipa for the week. They feared it might be too late, but took a chance and started the journey. They were able to hitchhike through the middle of the night from their home into the city, then bought a ride in the back of a pickup truck to Arequipa. When they arrived at the hospital the CSI team was happy to add their precious child to the already full surgical schedule. Even if the days run late, our teams are willing to change yet another child’s life.